One additional chapter discusses the Rosetta mission, a "comet chaser" that was sent on a ten-year journey in 2004 to study the comet Churyumov-Gerasimenko using, among other instruments, a GC/MS system incorporating a specially designed ion trap mass spectrometer. This comprehensive reference also includes discussions of the history of the quadrupole ion trap, the theory of quadrupole mass spectrometry, the dynamics of ion-trapping chemistry in the quadrupole ion trap, the cylindrical ion trap, miniature traps, and linear ion traps. Complete with conclusions and references, this primer effectively encapsulates the body of knowledge on quadrupole ion trap mass spectrometry. 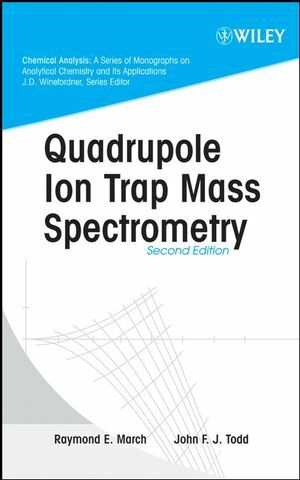 Quadrupole Ion Trap Mass Spectrometry, Second Edition is ideal for new users of quadrupole devices, as well as for scientists, researchers, and graduate and post-doctoral students working in analytical laboratories. RAYMOND E. MARCH, PHD, DSc, coauthor of the First Edition, is Professor Emeritus in the Department of Chemistry at Trent University in Peterborough, Ontario, Canada. JOHN F. J. TODD, PHD, is Emeritus Professor of Mass Spectroscopy at the University of Kent in the United Kingdom.